1501 Broadway, bet. W43 & W44. Rendering copyright Simon Fieldhouse. Click here for a Simon Fieldhouse gallery. 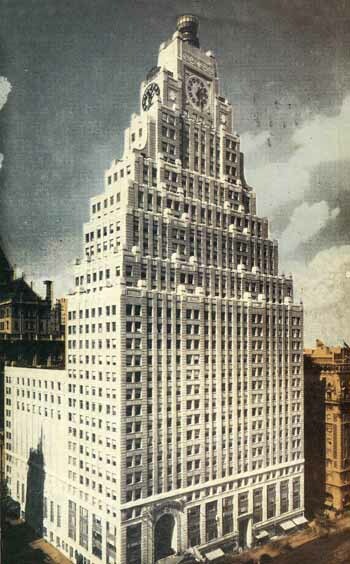 The American Architect warned in 1924 that given a large avenue site, "and designing according to the letter of the setback law, there would result a commonplace suggestion of one box paced on top of another. These boxes may be cubes or higher or lower boxes, but if nothing further is done to them, they will remain, in suggestion, as simply one box on another and they cannot in the mass suggest a unified design." Two years later, in a similar vein, DeWitt Clinton Pond observed in Architecture that the first generation of pyramidal buildings were "characterized by an almost severe treatment of cornices or parapets." The Paramount Building was one of the more pleasing pyramidal towers. Built on the west side of Broadway between 43rd and 44th Streets, it continued the tradition of building theaters on relatively cheap side-street lots, while devoting the valuable Broadway frontage to an office block. 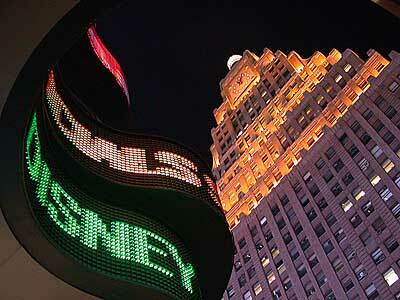 The Paramount completed the large scale reconstruction of Times Square begun almost twenty-five years before. While Rapp's twenty-nine story pyramidal mass applied the zoning requirements quite literally, they added some ornamentation -- stubby obelisks atop each of the eight setbacks, a glass sphere at the top, and a huge clock. Adolph Zukor, the future founder and chairman of Paramount Pictures and the original owners and residents of the Paramount Building, arranged the first ever showing of a feature film, Queen Elizabeth, to America, which starred Sarah Bernhardt at the Lyceum Theater in 1912. 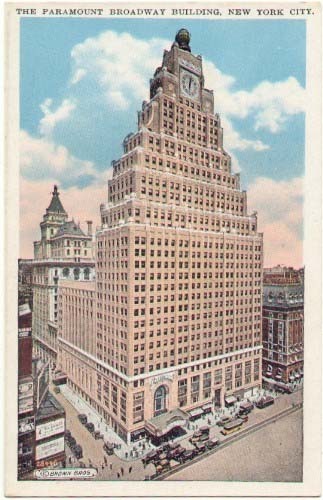 The Paramount Building sits on the site of the previous Putnam Building as named for General Israel Putnam who was considered the Patton of the American Revolution. The Putnam Building was erected to commemorate the spot where General Putnam met General George Washington. 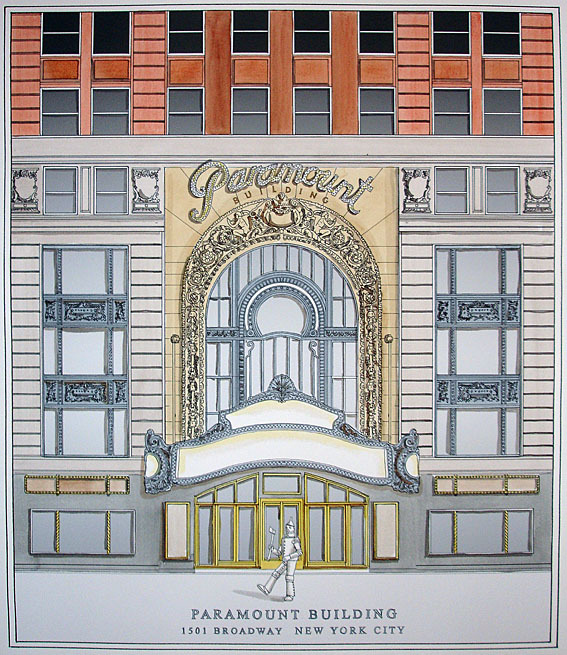 The Paramount Theater was designed by Architects, Rapp & Rapp. Rapp & Rapp's theater designs became the model for the opulent “movie palace” type of the era. 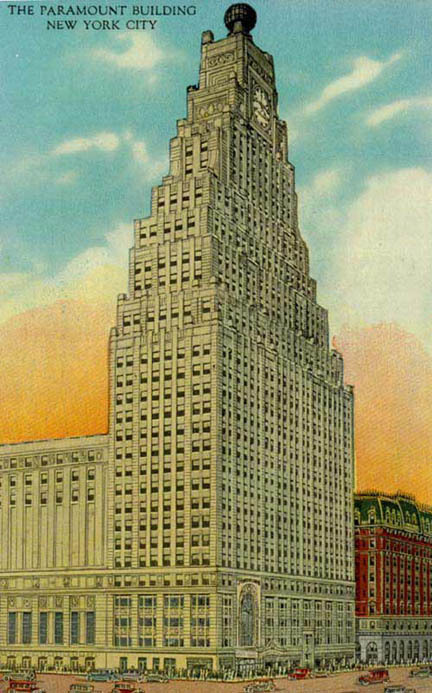 George Rapp also served as consulting architect for New York’s beloved Radio City Music Hall. 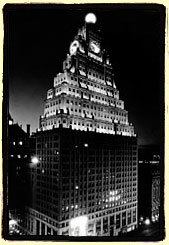 The Paramount Building was erected in 1926 at a cost of $13.5 million. 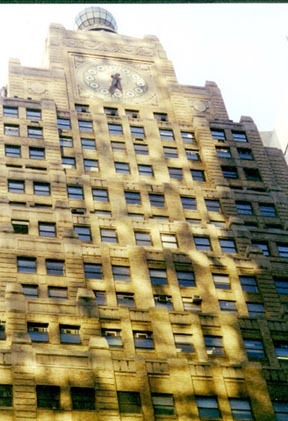 At thirty-three stories with a clock tower, the Paramount Building, when erected, was the tallest structure on Broadway north of the Woolworth Building and its illuminated glass globe could be seen as far as New Jersey. The well-known Paramount trademark ring of five-pointed stars surrounding a mountain peak is recalled in the design of the clocks, which symbolically cap a “mountain-like” building. With its 3600-seat theater and fabulous Marquee and Arch, the Paramount introduced the likes of Gary Cooper, William Powell, Mae West Fred Astaire, Bing Crosby and Claudette Colbert, to a city eager to make their acquaintance. Not only did its famed tower globe and clock cast a light that could be seen from New Jersey, but they illuminated an enthusiasm for silent film, and later 'talkies,' that was being felt around the world. The Paramount's stage was graced regularly by the likes of Benny Goodman, Jack Benny, Tommy Dorsey, Frank Sinatra, Jerry Lewis and Dean Martin to name a few -- it seemed that its majesty would never end. The globe and clock were painted black at the outset of World War II to maintain blackout conditions for fear of enemy invasion. The Globe and Clock tower were restored in 1996. Sometime around 1951, soon to be famous Disc Jockey (and eventually the first person to be inducted into the ‘Rock and Roll Hall of Fame’), Alan Freed coined the term “Rock and Roll.” Alan Freed became the musical influence of teens across the United States. From Alan Freed spinning tunes to Elvis Presley spinning his hips, a new age of music began and to many adults it was “the beginning of the end”. The Paramount Theater welcomed the changing times and became home to the Alan Freed Rock and Roll Stage show. On November 16, 1956, Elvis Presley’s first movie, Love Me Tender, premiered at the Paramount Theater. With the advent of television, many of the country's most majestic theaters declined in popularity and were soon demolished or converted to other uses. 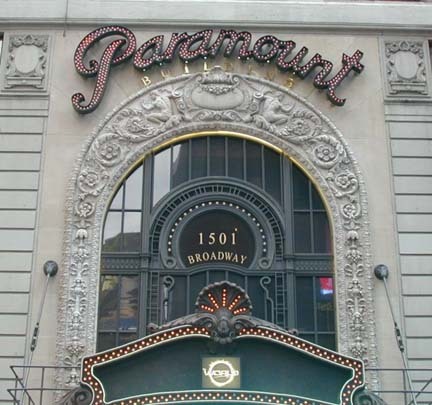 The Paramount closes its doors. The Theater space is converted to offices, the Marquee is removed and the Arch in-filled. The New York Times uses the basement of the former theater as storage space for newsprint. Rapaport Law takes over the 31st Floor. World Wrestling Federation Entertainment begins construction of their 47,500 square foot entertainment complex in May, renovating the interior for the restaurant, retail store and nightclub at a cost of over $38 million dollars. Reconstruction of the famed Marquee and Arch to restore the facade to its original grandeur began at a cost of nearly $8 million.2001With the completion of the Marquee and renovation of the New York Icon property Paramount Theater, WWF Entertainment has now taken the Entertainment Industry into the 21st century at the cross roads of the world, in Times Square."